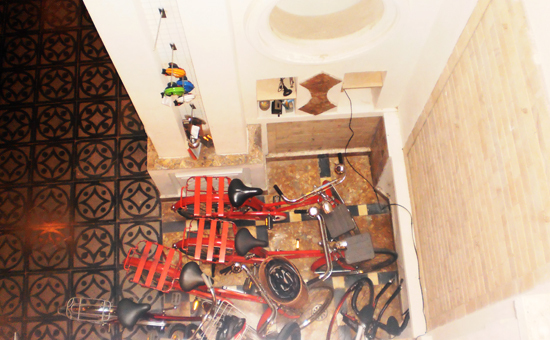 Where to start with The Hanoi Bicycle Collective? 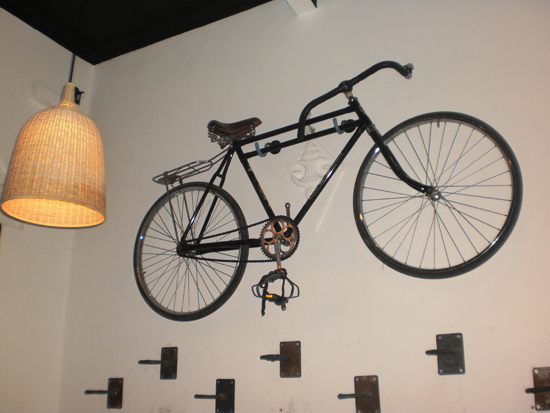 This bicycle shop / rental store / cafe / bar / entertainment venue really does cover all the bases, but my write-up was inspired primarily by the rental opportunity. 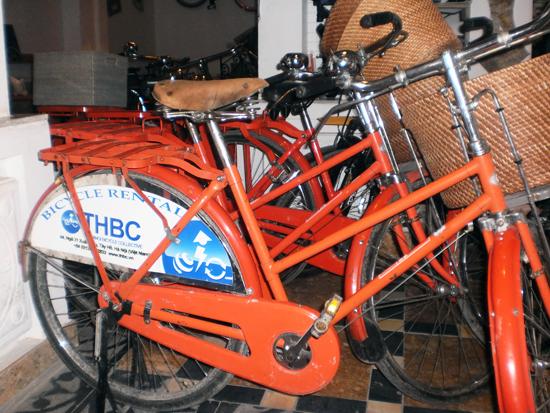 I’ve written before about biking around West Lake and The Hanoi Bicycle Collection is a great place to hire a bike for the journey, being good value and near to the lake itself. It’s all bikes bikes bikes. The venue, along an alleyway off Xuan Dieu Street, is a magnificent building with architectural features to delight even those without an eye for design. 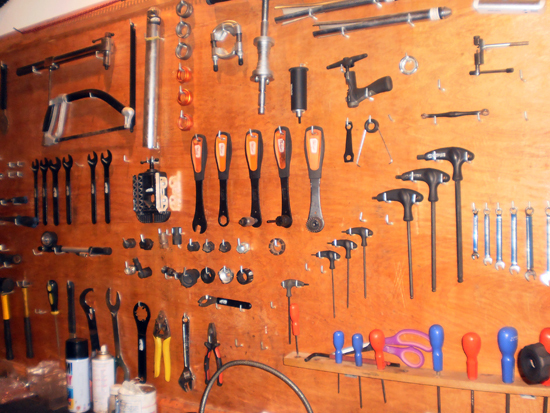 Most of downstairs is dedicated to bicycles which are available for purchase or rental, and this is also the place to come for repairs if you have your own bike. Both city and mountain bikes are available for rent and cost a very reasonable 50,000 VND half day / 100,000 VND full day, and 100,000 VND half day / 200,000 VND full day respectively. You’ll need to leave a deposit of around 2 million VND and present your passport. The city bikes aren’t particularly attractive but are practical and sufficient to get you round the lake or wherever else in the city you want to explore. 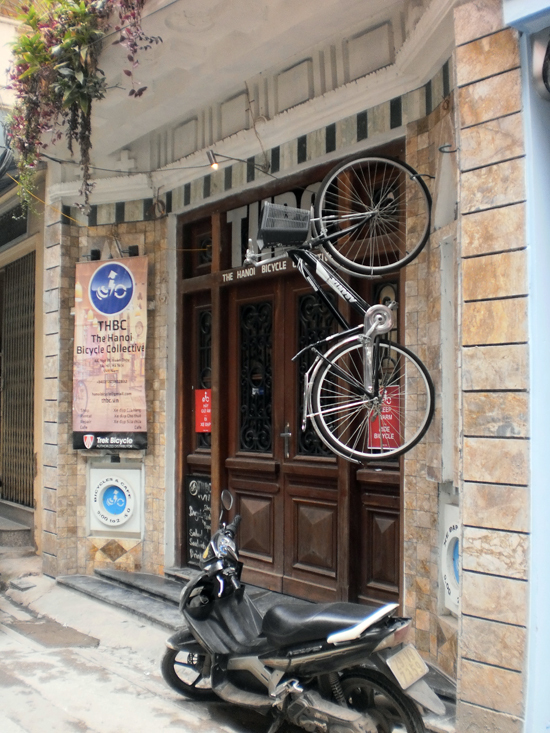 THCB is also recommended if you’re looking to buy a quality bike, perhaps for an adventurous trip down to Saigon, as they really know their stuff and you can feel assured that the bikes are authentic. Parts such as lights, racks and pumps, are also available. Even the tools look good. Even if you’re not in the market for a bike, THBC has something to offer. Their Gin & Bread cafe serves good coffee — including decaf — and what they refer to as ‘bocatas': essentially Spanish-inspired small, crispy baguettes with fillings such as serrano ham, tortilla (omlette) and cheese. Bocatas are available in mini or regular, but take my advice: mini is only sufficient for a snack and unlikely to fill you up, especially if you’re heading off for a cycle around the lake. Go all out with a regular. Toast, with various toppings, is also available for breakfast. And why the “Gin”? Well apparently it’s an excellent digestive and also makes “a most friendly companion” — that’s a good enough excuse for them to offer no fewer than four different brands of gin. Fantastic. While not a late night venue — its usual opening hours are 09:00 until 21:00 — THBC does host music and cultural events. For example, it’s recently hosted Malian musicians, Musbaba, and poetry events. Keep an eye out on TNH and Hanoi Grapevine for news.